This build has long been a favorite of mine due to its low gear requirements, high damage output and great survivability. This build does not require use of the Ninjabike backpack nor does it require classified gear - though, wearing classified pieces for the extra stats wouldn't hurt while you hunt down the remaining pieces to complete your sets. 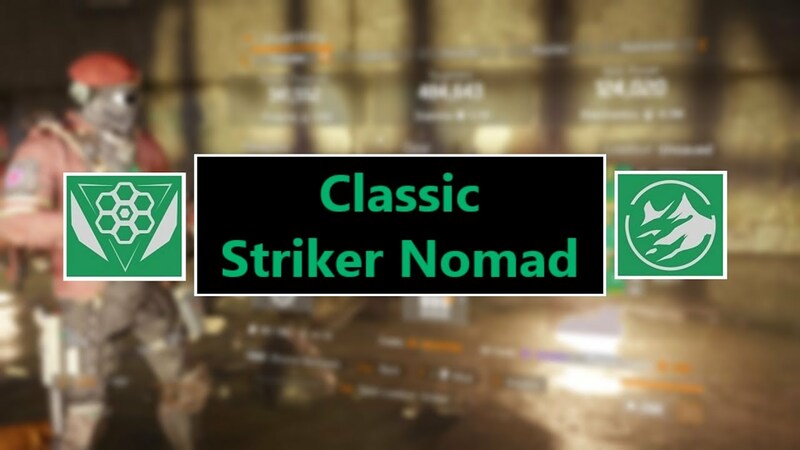 Thanks to the Striker set's 4 piece bonus we can have greatly increased damage output in longer fights that allow us to build up stacks, and usage of the 2 piece bonus of Nomad provides us with a large portion of our self healing. Thanks to the combination of the damage and sustain we can solo challenging content fairly aggressively without much fear of dying. But the build doesn't come without some downsides. First off, the low electronics keeps us from using first aid as a reliable healing source or attempting to do any damage with skills, but this is OK because there are a lot of utility-based skills we can use instead which are less dependent on high electronics. Secondly, the extra damage output provided by the 4 piece striker bonus is very dependent on not missing shots. Just one second of firing at and missing an enemy can drop 30-40 stacks of the striker damage bonus. Lastly, getting the killing blow is your source of regaining health and in the commanding variation of the build, killing blows are also how you extend tac links well beyond the baseline 13 second duration. To combat the drawbacks we want an accurate and easy to handle fast firing weapon that performs well in the majority of engagement ranges so assault rifles end up being our best bet and the native enemy armor damage helps greatly in PvE content. The best assault rifle to use would be the LVOA-C followed by Lightweight M4, then the G36 and ACR and to maximize our chances of bullets going where we want them to go we forego the typical headshot damage attachments in favor of stability and accuracy attachments. I would not actually run with both the M4 and G36; I wanted to show that I would use a laser instead of reload grip on a G36 if you had that one as a primary weapon. For skills, in Resistance without the help of a Reclaimer someone needs to have an ammo cache healing station and if you're running alone, who better than you? The healing of the station will be pretty much negligible however the utility aspect of free ammo doesn't care how much electronics you have so as long as you can keep the box up and running you'll never run dry on ammo. And again to combat the drawback of striker that you need as close to a laser beam weapon as possible Smart Cover is the second talent choice. The Concealment Smart Cover has both the longer 30s base duration of the trapper variant and the higher accuracy and stability of the recovery variant with only the minor drawback of a 6m radius effect instead of 8m. With the damage resilience performance mods you can sit in cover with an extra 26% damage resilience and if you get a kill while moving for the bonus 15% from On the Move, you'll be sitting pretty with 41%DR which translates to a whopping 70% more effective health! If you happened to also proc critical save somehow and stacked all three you'd get up to 61%DR which is just a couple points from the hard cap of 65% and 61% DR translates to 150% more effective health! Outside of resistance you can use things like the smoker seeker mine, flashbang sticky bomb, or shock turret. Why no ninjabike you ask? Because not everyone has access to it. Lots of newer players WILL have 4 pieces of Striker and 2 of Nomad. If you had a Ninja, there's plenty of other builds you could be doing but this one geared toward the newer playerbase and it's one of the best builds to get going so you can farm up classifieds and exotics. Why no Ninja Bike? One with similar stats would add the 3 piece nomad bonus and keep you at the same capability? I’m a new player and I think this may be the build I go with. Thanks!